Inspiration Fabrics is a full service Quilt Shop, as well as an authorized Viking Husqvarna and Pfaff dealer. We are located at 2478 Patterson Road, Unit 23. Grand Junction, Colorado. Our telephone number is (970)233-8771.We are located in the Patterson Village business park. 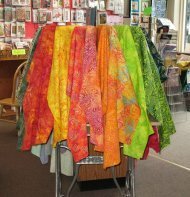 Specializing in bright and unusual contemporary fabrics, we also have lots of batiks, a beautiful selection of Kaffe Fassett Fabrics as well as Australian prints, plus traditional prints, solid color cottons as well as our great selection of flannels. Browse our large selection of books, our many patterns for quilts, wall hangings and bags, plus any supplies, tools, and “toys” you might need/want. We carry a full line of Husqvarna Viking & Pfaff sewing machines, parts, notions, and accessories. 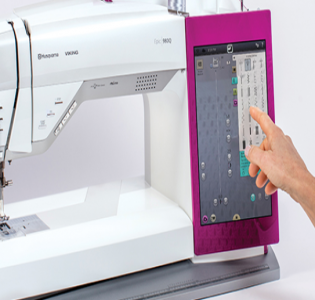 There are classes and clubs to fully enjoy and utilize Viking & Pfaff sewing and embroidery machines — and we have a lot of fun! We have on staff an experienced and factory certified technician doing repair and maintenance on all our Vikings and Pfaffs. We have classes all the time and they fill up fast. Check out our list and call the shop to reserve your spot. What’s next? Inspiration Fabrics has been in business for over 30 years (as Glenwood Sew) and we are very excited to start the next chapter in Grand Junction. We are here to help so please stop in with your sewing question and our friendly and talented staff will be happy to assist you. Don’t miss the lovely article that the Glenwood Post Independent wrote about our shop. Just click on the link below. Check out our class listing and sign up to make something new! We have new fabric from Moda, Anthology Batiks, and much more. Stop in and check it out! We are a full service Husqvarna Viking dealer. 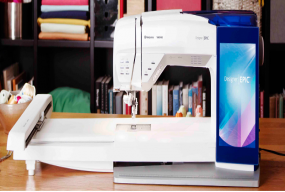 Stop in to see all the new machines, from sewing to embroidery machines, sergers and long-arm quilters.